No one will work harder for you and simultaneously make the real estate experience more enjoyable than Leslie. This determined, helpful, enthusiastic professional truly gives her all in satisfying clients, and does not quit until their real estate needs have been met. A natural at sales who's worked in the retail, restaurant and entertainment industries, Leslie can hone in on what people want and match them with the very best service and solution possible. She understands the art of listening as she does the importance of communication, so always has a pulse on her clientele's goals every step in their transaction. Her positive attitude and tenacious work ethic are at the heart of what makes Leslie an invaluable asset to have on anyone's side when buying or selling a home in the city. Originally from Columbus, Ohio, Leslie earned a BFA degree in Musical Theater from Kent State University. Upon graduation, she moved to New York City and has lived in neighborhoods ranging from the Upper East Side and Washington Heights to the East Village and Brooklyn. 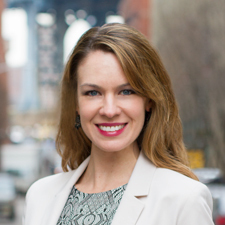 Now residing in Dumbo, Leslie loves her community and thrives on its diverse cultural offerings. She enjoys dining out, live music, theater and museums. Leslie is also a talented singer, actress, dancer, songwriter and pianist who loves to entertain. Travel, fitness, and time with family are also important to Leslie when leisure time allows. She believes in making the most of now and treasuring life's many blessings.